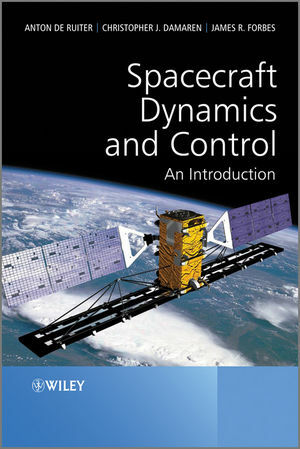 Spacecraft Dynamics and Control: An Introduction presents the fundamentals of classical control in the context of spacecraft attitude control. This approach is particularly beneficial for the training of students in both of the subjects of classical control as well as its application to spacecraft attitude control. By using a physical system (a spacecraft) that the reader can visualize (rather than arbitrary transfer functions), it is easier to grasp the motivation for why topics in control theory are important, as well as the theory behind them. The entire treatment of both orbital and attitude dynamics makes use of vectrix notation, which is a tool that allows the user to write down any vector equation of motion without consideration of a reference frame. This is particularly suited to the treatment of multiple reference frames. Vectrix notation also makes a very clear distinction between a physical vector and its coordinate representation in a reference frame. This is very important in spacecraft dynamics and control problems, where often multiple coordinate representations are used (in different reference frames) for the same physical vector. Essential reading for graduate level aerospace engineering students, aerospace professionals, researchers and engineers. Anton de Ruiter, Assistant Professor, Mechanical and Aerospace Engineering Department, Carleton University, Ottawa, Canada. Obtained his PhD in Aerospace Engineering from the University of Toronto in 2005.? Until 2006 he was a Visiting Research Fellow at the Space Technologies Branch of the Canadian Space Agency. ?His interests include Nano-Satellite Technologies, Interplanetary Missions, Spacecraft Formation Flying, Spacecraft Attitude and Orbit Determination and Control, GPS-based Spacecraft Navigation, Control Systems, and Optimization Theory and Applications. ?Professor De Ruiter has written extensively on spacecraft dynamics and related topics for journals, articled papers and conference proceedings. Christopher J. Damaren, Professor, University of Toronto Institute for Aerospace Studies. Obtained his doctorate at UTIAS in 1990 in the area of control systems for flexible spacecraft. In the 1990's most of his research concentrated on control system design for large structurally flexible robot manipulator systems such as the Space Station robotic systems developed by Canada. Since joining the faculty of UTIAS in 1999, his research group has been involved in the dynamics and control of spacecraft including the orbital, attitude, and structural motions of these systems. James R. Forbes, Assistant Professor, Department of Mechanical Engineering, McGill University.